Australian startup Pozible has announced their arrival in the US, setting up shop in San Francisco and introducing two major new crowdfunding innovations. These new features will resolve the limitations of running one-time crowdfunding campaigns on Pozible, and to prompt more creative ways users can engage with fans and supporters. 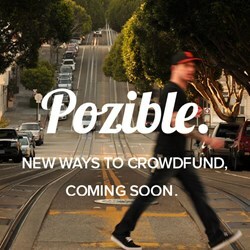 Pozible, the largest Crowdfunding platform in the Asia-pacific, has announced their arrival in the US; setting up shop in San Francisco and introducing two major new crowdfunding innovations. "The goal of these new features is to resolve the limitations of running one-time crowdfunding campaigns on Pozible, and to prompt more creative ways users can engage with fans and supporters." - Alan Crabbe, co-founder. Pozible's new subscription crowdfunding model resolves the administrative nightmare of having crowdfunded subscribers maintained on multiple payment systems. It is now perfect for anyone wanting to run a one-off crowdfunding campaign and generate recurring income on a subscription basis from supporters. Unlike similar services already on the market, Pozible opens this service to everyone, allowing all users to simultaneously offer both subscriptions and the regular one off rewards. Examples include magazines and digital publications, local co-share working spaces, craft breweries and wineries, or for charging periodic membership dues. Rising Sun (http://www.pozible.com/risingsun), a Sydney-based co-working space for motorcycle enthusiasts, used crowdfunding to secure pledges in return for founding memberships and raised AUD$38,500. HUB Sydney, (http://www.pozible.com/hubsydney) a co-working space, surpassed its target of 20K, raising $AUD$33,750 in their founding membership crowdfunding drive on Pozible. Also new is Pozible's self-hosting tool, allowing users to embed a non-branded crowdfunding campaign on their own website or domain. This is ideal for high traffic sites, users desiring more branding control, and users who don't wish to redirect existing audiences to a crowdfunding platform. Examples include: not-for-profits, festivals, colleges, techies, designers, and high profile creatives. Since launching in Australia 2010, Pozible has grown to be the largest crowdfunding platform in the Asia-Pacific region, as well as globally outside the US, opening offices in Melbourne, Sydney, Xian and San Francisco. Pozible accepts multiple currencies and payment methods (including PayPal and Stripe). To date, Pozible has hosted thousands of projects, and generates more than $1m per month in Australia alone. Pozible maintains one of the highest project success rates (currently ~55%), thanks to localised one-on-one support, hosting regular offline workshops/info sessions and getting involved at a grassroots level. Supplementing this offline support is the active outreach community of 100+ experienced creators – the Pozible Ambassador Network – who advise on and fine-tune projects of new users, spot potential new projects and earn rewards of their own. Pozible differentiates itself from other platforms in a number of ways. First, Pozible is opposed to curatorship. So, while every project is screened by staff for crowdfunding 'readiness', rather than being rejected outright, all are given tailored feedback to improve. Second, Pozible pioneered the innovation of matched-crowdfunding by embracing industry partnerships. In 2012, AUD$250,000 was channelled to independent film-makers by the State body ScreenWest who matched $3 for every $1 pledged by the public. Third, Pozible is now the first major platform to provide both subscriptions based and self-hosted crowdfunding.